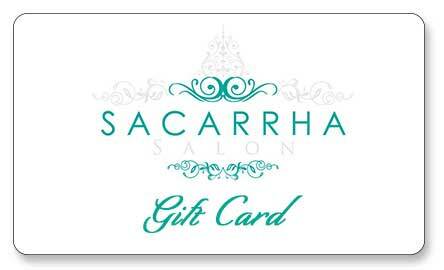 A Sacarrha Salon gift card is a great gift for any special occasion or just to say thank you! Gift cards are available in a dollar amount or for a specific service or package. (On the check out screen click "Change Shipping"). Want to purchase an E-Gift Card that will be email to the recipient? Click here! Sacarrha Salon is a boutique salon offering, hair, nails, makeup, waxing and bridal services. Whether you simply need a new look, a relaxing escape, or are planning that all important special event our professional and caring staff will work with you to plan and customize an approach that is unique to you. Come visit us in our beautiful, upscale salon and treat yourself to any of our exceptional services. At Sacarrha Salon we will help you look and feel relaxed, refreshed, and looking your best! We require a 24 hour notice for any cancellation to avoid a 50% of service charge. No Show Appointments will result in a 100% of service charge. Thank you for your consideration of our policy and your stylist's time. We conveniently provide text or email in advance for appointment confirmations. Please note that we cannot add gratuities onto credit cards.